Nothing fancy. 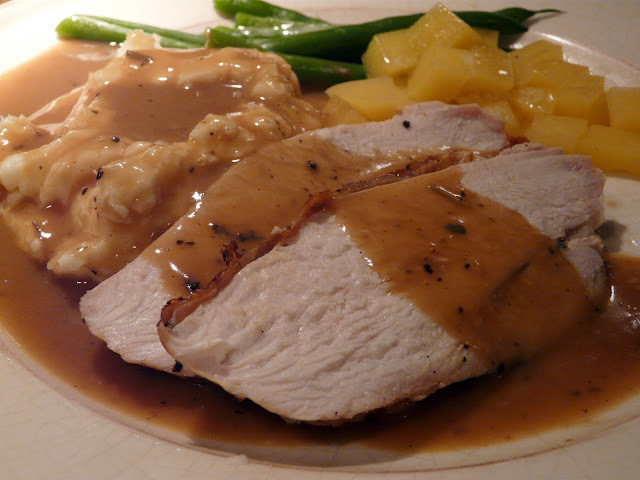 Just roast turkey breast, mashed potatoes and gravy, rutabaga and green beans. Not fancy but sure tasted good. I presalted the turkey the day before and uncovered it Thursday morning so that it could air dry, making for a more crispy skin. This was a boneless turkey breast so it didn't take long to roast. I worked yesterday so Moe had the oven preheated and the turkey out of the fridge before I got home. Roasted at 500°F the turkey went into the oven at 5:30 and was out of the oven before 6:30. While the turkey rested, the vegetables cooked and dinner was on the table by 6:50 PM. That sounds so good. I love turkey anytime of the year. I am on my way to the grocery store. Think I will be looking for a turkey breast! Yum. I have been craving a turkey dinner Ann...I would love to have a bite of yours right this minute!